Del Rey has submitted The Best of All Possible Worlds to the literary subcommittee of the NAACP Image Awards for consideration in their literary awards category. Now this is not quite a situation like the Oscars where I can hope for a full-page FOR YOUR CONSIDERATION ad in the major newspapers, but it feels very exciting and awe-inspiring and important to me. In fact, it’s so important that I have a request. I understand that many reviewers like the fact that The Best of All Possible Worlds sites people of colour firmly in the future, in space, on colonies, in a way that is unfortunately unusual for much of the SF we encounter in books and movies. It’s okay for people to be happy about that, but I come from a region whose people and educational system have always had a firm grasp of global demographics, so for me it doesn’t feel like a particular virtue to have written the future the way it’s most likely to be. What I am wondering is whether certain parts of my book are being overlooked by readers and reviewers who are not well-versed in postcolonial and Caribbean literature. I’m referring to two chapters: ‘Bacchanal’ and ‘The Master’s House’. I’d be so grateful if an academic or reviewer in Caribbean and postcolonial literature could examine, assess and critique the book in general and those two chapters in particular from a position of expert knowledge. My job is to write the stuff, not explain it, and my policy is to rarely react to reviews, so I can’t guarantee any kind of ‘you’ve got it’ endorsement. I simply want to see a discussion started in an area that I feel is significant but has been barely mentioned as yet. I’ve been working hard on some projects and thus only updated where I could be brief – twitter, Facebook and a couple of times even tumblr. But now I have a little time, so I’d like to recap some of the old good news. I didn’t make a final post for my Carolinas trip, but there was not much more to tell. I had a fantastic time at Orange County Library and Chapel Hill Library with audiences that were far more mainstream/literary than SF, but very attentive and appreciative of my work. I also did a reading at Flyleaf Books. Very enjoyable – smaller audience, but the questions were still of a high calibre. People who follow me on twitter would have seen that I came home and quickly went into AnimeKon Expo, our Bajan SF convention. Tobias Buckell was back, Robert Edison Sandiford had a new book out, and we had a bit of a Three Musketeers thing going where we had a panel together, kept our book tables side by side, and even managed a field trip for some story research. This was so soon after the Carolinas trip that it was hard for me to be at 100 per cent. I wish I’d had more energy and preparation time to get full benefit from the event, but I’m fairly happy with what I was able to do, and it’s always hugely inspiring to hang out with Tobias and Robert and talk Caribbean SF. I’ve been invited to be Guest of Honour for the 2014 Åcon SF convention in Finland (SO EXCITED YOU HAVE NO IDEA). Details to follow in due course! I celebrated the release of Jeff VanderMeer’s amazing writing guide Wonderbook on twitter, tumblr and Facebook. I’m extremely proud to be one of the contributors; you can find my essay on page 27 (here’s a teaser). There’s so much beauty and inspiration in that book that you’ll never get bored. I was surprised and very pleased to find that The Best of All Possible Worlds made it to the semifinal round of the Goodreads Choice Awards Best Sci-fi category as a write-in-vote with reader support. Thank you so much to all those who voted! Finally, I was absolutely thrilled that RT Reviews nominated The Best of All Possible Worlds for both Best Science Fiction and Book of the Year. The awards ceremony takes place at their annual convention, which is being held in New Orleans next year! Tempting! Very tempting! Draw him, colour him, dress up as him—I think every kid remembers the first superhero he created. Not that first ideas are always the best. My concept, at age eight or nine, was awful. The character was wealthy Reginald Van Buren. His sidekick was his muscular manservant—whose name I can’t recall—and very British. Their alter egos: Black Butterfly and Brown Derby. Years ago, on safari, Van Buren discovered a giant black pearl that gave him, when rubbed, the powers of a butterfly, including wings. I hadn’t fleshed out an origin for Brown Derby, whose name came from the kind of hat he wore. (As I said, first ideas.) I got two or three pages of very rough colour pencils done in a blue Hilroy exercise book before I moved on to my next comics project: Lieutenant Laser Eyes! These dreams of a grade school comics creator were derivative, built on conventions of the genre: wealthy hero, able sidekick, fateful adventure, mysterious powers. The ideas behind the characters needed converting or embellishing. Where the characters had true merit was in my aspirations: all the lead heroes mentioned above were black, with traits and speech drawn from people I knew, people who looked, sounded and acted like me in Montreal’s West Indian community, my community. Throughout high school and university, this trend/inclination/artistic choice (I’m not sure what to call it since I wasn’t conscious of it at the time) continued. My character Bobcat, leader of a Canadian superhero team, was black. Safeguard of the North—my answer to Captain Canuck and Guardian and Northguard—was black; or at least not as white as the great northern country he represented might expect him to be. Despite buying comics where the main heroes were usually white—or maybe because of this—it never occurred to me how unusual my choice was. I was a black boy creating black heroes. What was so unusual about that? Seeing myself in them was about making reality more real, more complex and complete. Still, it was a decision I should not take for granted. I teach research methods and research paper writing to BFA Graphic Design students at Barbados Community College. A number of my students are into graphic novels. They read them and write them and draw them in their spare time or as part of their major and minor graduation exhibition projects. According to the 2012 Census, eighty percent of Barbados’ population is black, and sixteen percent is of mixed black and European ancestry. My students’ environment is, therefore, visibly black. When these students enter the programme, however, many of them show work that is heavily inflected by anime and manga; their panels are not populated by characters who look like them or the people they are most likely to meet in their neighbourhood. One of my students shared a story in class about creating a character in high school that was a protector of Barbados. The hero’s familiar was a water dragon. When one of his teachers asked him why his hero wasn’t black, or why the character didn’t reflect its creator’s own culture in other ways, he told her these thoughts had not occurred to him. At all. Another student in the class, fairly well-read and also an aspiring graphic novelist, said he could never find the epic in Caribbean stories, that spark to fire great works. The cartoons from Japan he and his colleagues followed, the comics from that country they absorbed, seemed more resonant than anything their history or reality might make possible. The crime—let’s call it that—wasn’t that too many of my students couldn’t see the epic in their own people’s stories, which included the Middle Passage, slavery, colonialism, post-colonialism, neo-colonialism, indigenous mythologies and folklore. The crime was—is—that they had never thought to fan the fire themselves: to create what was missing, to suggest what was possible, to write the stories about their own people that they wanted to read. Part of the problem was the social engineering they had undergone as Barbadians, which I examine in my new novel And Sometimes They Fly. My students and many Barbadians like them were raised to believe other people’s heroes saved the world, not their own. Who would these worthy men and women be anyway? Their politicians didn’t call in the good guys when the going got tough; they considered themselves the good guys, and had put commemorative plaques on buildings and open spaces all around the island that essentially said so. Coupled with a decline in oral storytelling not redressed by a more active publishing industry, this belief in the outside hero has spelt the demise of the fantastic in much of Barbadian Literature. Not entirely, of course. Barbadians—and their stories—are more tenacious than my students might think: more entertaining, more epic, and hence more enduring. Try, as Bajan or world critic, to dismiss writers like Kamau Brathwaite, Geoffrey Drayton and Timonthy Callender. You’d be missing out if you weren’t aware of others like Glenville Lovell, Ronald A. Williams, Karen Lord, and Matthew Clarke. It takes cultural consciousness to resist the drag of negative foreign incursion; the kind of cultural consciousness that can conceive of anything, including a black Superman. But not a black Superman. Despite successful renderings of, say, a black Green Lantern or a Latino Spiderman, I never wanted coloured-in versions of my favourite heroes. I wanted originals of my own, fighting battles people rather like me would fight. When I came to write And Sometimes They Fly about fifteen years ago, it was not as a literary fantasy novel but as a superhero comic about a group of young people who fought to save the world. At some point over the years, I decided to tell the story in prose instead, yet I, too, was still missing that sense of the epic: Who were these young people, meaning where did they come from, and whose world were they fighting to save? The tragedies of 9/11, which seemed to touch on everyone’s life everywhere on this planet, provided the necessary perspective, as metaphor for cataclysmic conflict, and moment for godlike redemptive intervention…if one so chose. Yet it was the folklore of the Caribbean, of Barbados specifically, that provided contemporary context, the proper symbols, and an ongoing socio-historical discourse out of which the story could emerge. The epic in any work comes from the writer’s understanding of his people and their place in history, what we might call Time, here; even if his people are embodied in an individual or their place is no larger than a village. His people, regardless of their number, race, faith or colour, are inevitably humanity itself, or his conception of it. Events in Egypt or Syria can have magic or tragic consequences for a family or woman in Barbados or Trinidad. The epic reveals the possibilities of a grander world, one made up of the worlds we already know and of others we still struggle to explain. To imagine ourselves onto that boundless landscape, as writers and readers, is no privilege, then, nor should it be viewed as a burden. It is merely our right, and our responsibility. 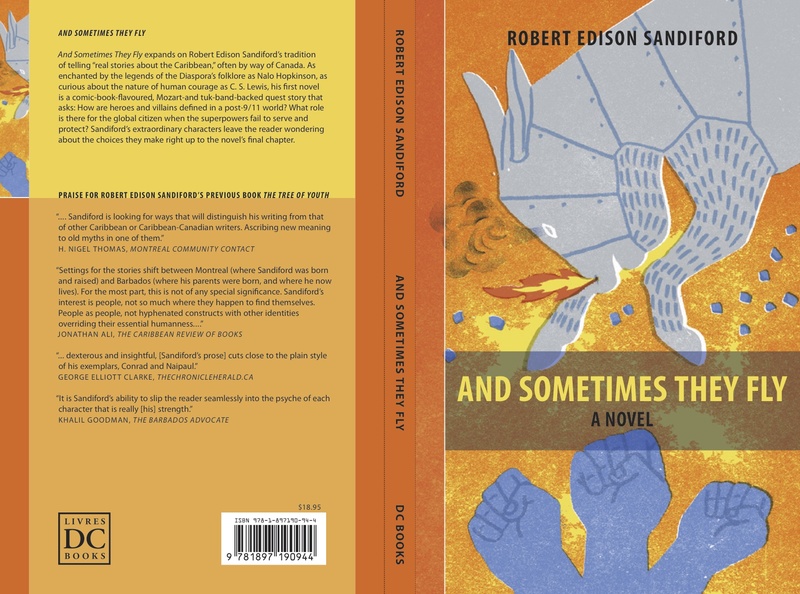 Robert Edison Sandiford is the author of eight books and co-founder with Linda M. Deane of ArtsEtc Inc. His novel And Sometimes They Fly will be released in July by DC Books. Today I heard the sad news that Thomas Armstrong passed away on Saturday. I first met Tom in January 2009 at the ceremony for the 2008 Frank Collymore Literary Awards where my novel took first prize and his took second. After that we often met at literary events. There’s an entire tag dedicated to him on this blog. Some posts are a mere passing mention, but there are three worth reading, my three part interview with Tom back in late 2010. I strongly recommend them. You may never heard of Thomas Armstrong before today, but if you read those posts you will see why he was an important voice among the Caribbean literati. Rest in peace, Tom. Thank you for your insight, your writing, and the love you had for my country. The last episode of my podcast series with Karen Burnham went up on SF Signal last Thursday. I was at first slightly peeved that there was another cool thing to blog about that would have to wait until I got back from Toronto, but the delay ended up being profitable. Thanks to Cheryl Morgan and Karen Burnham, we now have a cleaner, better audio for Episode 6 (The Sparrow, by Mary Doria Russell). All the podcasts can be accessed via the link http://www.sfsignal.com/archives/category/columns/sf-crossing-the-gulf/ but they show up in reverse chronological order, as tagged posts are wont to do. This gives me an excuse to list them here separately with relevant comments and links. Click here for my post on this blog introducing the podcast in general and this episode in particular. I included library links for My Bones and My Flute and The Rainmaker’s Mistake. My deepest regret for this podcast was the challenge to readers trying to find a 1950’s, out-of-print book. But Mittelholzer is a key West Indian author and I could not imagine starting a discussion on Caribbean SF without him. You can read about the lengths I went to in order to secure a copy. Running out of time for Ted Chiang during Episode 1 proved an advantage as we spent Episode 3 comparing and contrasting his work with Greg Egan’s. Click here for a reading and interview with Erna Brodber, and links to other interviews, reviews and resources. I was afraid this would be too challenging, but Karen took to it like a duck to water and shared with me some important insights into this literary work from the point of view of a non-West Indian and a genre reader. I had to urge Karen not to be modest about the fact that she has spent over three years researching Egan’s fiction. With her knowledge of Egan’s entire fictional universe(s), she stopped me from making assumptions based on the snapshot of a single short story. We acknowledge that we’ve missed out some of Egan’s best work because we chose stories available for free on the internet. We hope to make up for this in the future. Oh, you have no idea the pangs this episode gave us. We loved the book, we were in awe of the author, and we spoke with fluid eloquence (relative to previous podcasts!) about our love and awe. But Karen was moving house and the change in the usual setup resulted in some distressingly poor audio. We actually decided, very sadly, to re-record the podcast, but bad weather (I cannot podcast during heavy rain and/or thunder!) and continuing tech issues made that impossible. Karen did her best to manually improve what we had. However, I am very happy to report that Cheryl Morgan recently performed some added cleanup and with their combined efforts we now have a fresh upload of a podcast that should be much easier to listen to. I thought Karen would find this easier and more enjoyable than The Rainmaker’s Mistake and I was wrong (though thankfully not badly wrong). I think there is more in there for the reader who knows West Indian history, culture and literature and gets the little hits of nostalgia and recognition at the right moments. Nevertheless, Karen was very appreciative of the author’s talent and put it into the slipstream category with The Rainmaker’s Mistake. Overall verdict on Caribbean SF? Readable, enjoyable, layered, literary and well worth the effort. We made it to the end, and we finally found a graphic for the podcast! You may already know that Karen Burnham’s internet moniker is Spiral Galaxy. 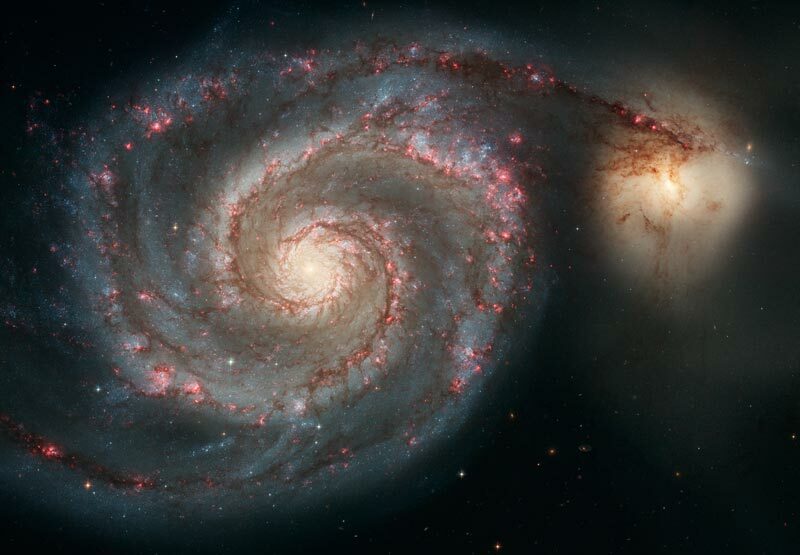 The photo shows the Whirlpool Galaxy interacting with its companion NGC 5195. We decided this interaction was a symbol of clear boundaries vs fuzzy boundaries, the linear vs the elliptical … which is a good way of differentiating between hard SF and Caribbean SF as well as different reader/critic approaches to understanding them. I won’t be changing my moniker to Elliptical Galaxy just yet, but it pleases me to think that there might be a curve and a swerve and a cycle to how I tell and read stories as well as a certain lack of defined boundaries that might be a challenge or a delight. For the seventh episode of SF Crossing the Gulf, we discuss Ghosts by Curdella Forbes. I liked Ghosts when I first read it, and I liked it even more after our discussion. It was published August this year and is available at the publisher and at the usual online bookstores. Recommended for lovers of literary SF in general and slipstream in particular. This is the last book of our podcast series as our final episode will be a rambling wrap-up of all that has gone before. First of all, congratulations to all the Hugo award winners, and special congratulations to the winner of the Campbell Award for Best New Writer, E. Lily Yu! Secondly, it’s Wednesday-fortnight again and that means podcast! I’m delighted to be discussing The Rainmaker’s Mistake by Jamaican writer and sociologist Erna Brodber. I thought Karen Burnham would find it challenging – hah, she didn’t! And she loved it and we hope you do too. You can listen to the podcast here at SF Signal, but before you do, it’s worth visiting The Spaces Between the Words for an interview with Erna Brodber that will enhance your podcast experience.